The problem with video capture issues looks more or less clear. As explained by Mike M here, the breaking changes in Windows 10 Anniversary Update are caused by intentional redesign of the platform that enable shared access to video capture devices. … it is now possible for multiple applications to access the camera in ways that weren’t possible before. It was important for us to enable concurrent camera access, so Windows Hello, Microsoft Hololens and other products and features could reliably assume that the camera would be available at any given time, regardless of what other applications may be accessing it. Originally video capture application were highly performance sensitive due to insufficient horsepower of computers overall, and sharing of video capture sessions between the applications was not on agenda. Then Microsoft hibernated for over a decade and did not do updates to the platform to follow software and hardware trends. Those needing camera in 2+ applications had to use third party camera splitting software. Time has come to include video sharing to the platform and… that washed away support for compressed video formats. If camera is shared, who is going to decode video into presentable format? Guys at Microsoft decided that they will, that is it’s now “decode then share between applications” scenario. When an application runs video capture session, Windows 10 Anniversary Update now runs the actual session in a service process. 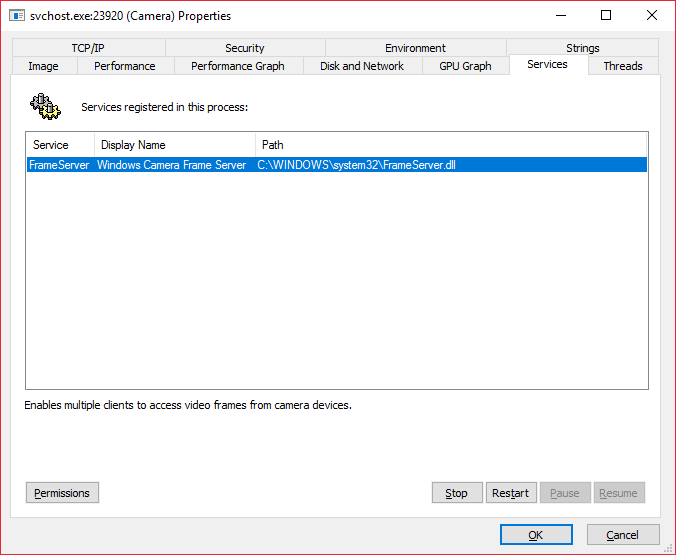 A new Windows Camera Frame Server service is responsible to acquire video, decode and distribute it. Applications access FrameServer service with the help of FSClient.dll connecting to shared service which runs actual session. 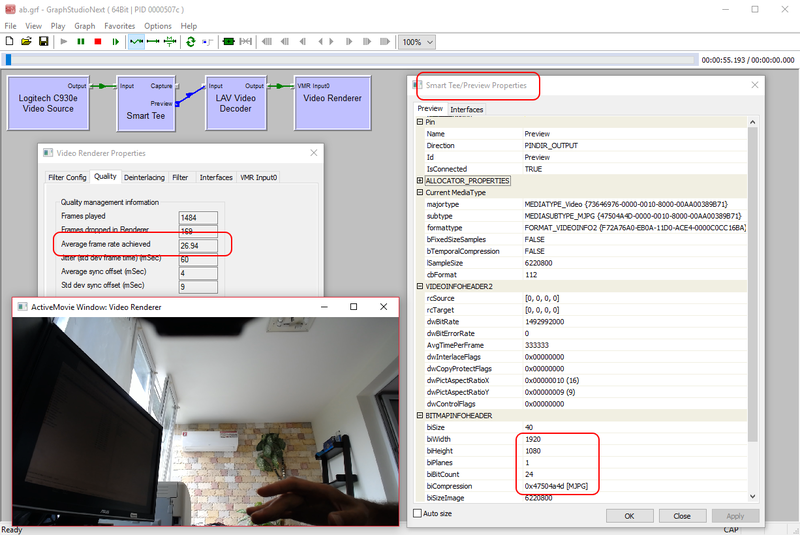 I am not sure how sharing works exactly, but I was unable to start two TopoEdit instances doing video capture from the same camera. Presumably, default behavior is still imitating exclusive use of hardware and possibly priority clients (like mentioned Windows Hello) have new ways to take over video capture device on demand, or we will see new functionality with respective SDK/documentation update. Applications now – as it is assumed from the description – get the only option to communicate to FrameServer service and not the video capture source directly. On that way, formats like MJPG and H264 are lost. As recent comments indicate this to be a well planned and scheduled scenario, it looks unlikely that things are going to change. It was decided that there is no exclusive mode video capture, just shared. Developers are to wait for possibly changed attitude and something similar to WASAPI exclusive low-latency mode for those specific application which need it. 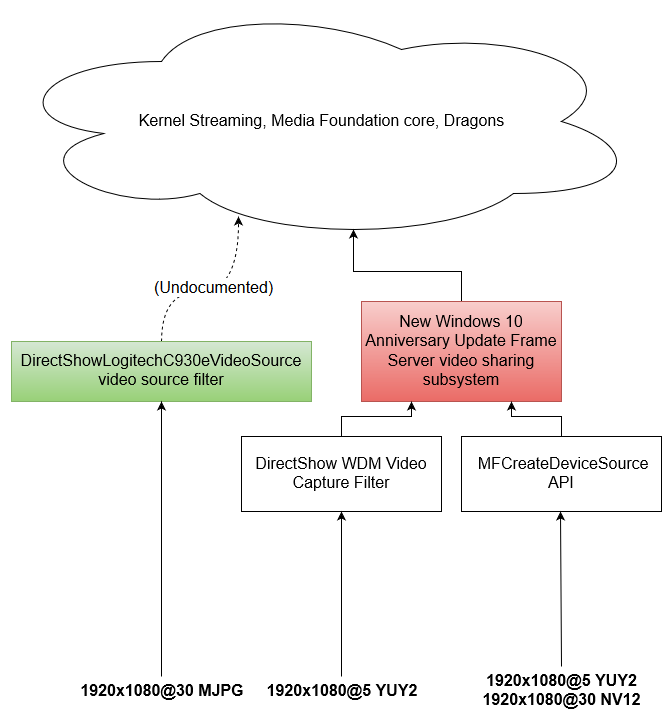 So yes, MJPEG and H.264 being decoded / filtered out is the result of a set of features we needed to implement, and this behavior was planned, designed, tested, and flighted out to our partners and Windows Insiders around the end of January of this year. We worked with partners to make sure their applications continued to function throughout this change, but we have done a poor job communicating this change out to you guys. We dropped the ball on that front, so I’d like to offer my apologies to you all. A small relief is that they restructured the platform and not dropped the support for MJPG and H264 in first place. Okay, there is no formal access to compressed streams using standard API but a stab into doing it undocumented way shows that all the gear remains in place. This of course takes again exclusively control over the camera and prevents from sharing video feed as the update intended. However, the video itself is where is was. There is no public source and/or details on this filter because it’s sensitive to undocumented behavior of Media Foundation platform. Just as a demo, the DLLs are there: Win32, x64. (limited to Logitech Webcam C930e’s highest MJPG mode but basically the method could work for any MJPG camera, and C930e’s H264 too). That is, if your application is broken by Windows 10 Anniversary Update because you simply assumed availability of specific modes, then there is a chance that update of the application to make it compatible to new platform design with FrameServer service could fix it. If you intentionally consumed compressed video for quality, rate and performance reasons then you’re in trouble and there is no really a solution from Microsoft is expected soon. Perhaps the best would be to not upgrade to Anniversary Update.